Low density, high strength and high hardness are characteristics shared with many other ceramics. Silicon carbide offers low thermal expansion, high thermal conductivity, strong thermal shock resistance and elevated chemical intertness as it is not attacked by acids, alkalis or molten salts. A modern ceramic material, silicon carbide is classified as an advanced, technical, or engineering ceramic due to its superior attributes. 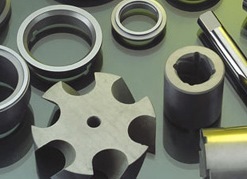 Silicon carbide components are common to industrial environments as they are particularly well suited to the high stress needs of these settings. Electrical conduction, semiconductors, automotive, structural and abrasion industries are just a few of the many sectors in which silicon carbide is utilized. Grinding machines, brake discs, seals, bearings and heat exchangers are all commonly made of this material, maximizing its heat resistance and conductivity. Silicon carbide grit can also be used to create ground glass for use in photographic equipment and in the creation of decorative glassware. Although natural occurrence of silicon carbide is rare, several processes allow for large production of man-made replicas of this substance. The Ascheson furnace and Lely are commonly used methods. The Ascheon technique involves heating silica, carbon and other additives that increase porosity to maximum temperatures and then gradually lowering them. The Lely process sublimates the particles in an argon atmosphere by heating them in a fashion similar to the Ascheson furnace. Chemical vapor deposition is sometimes used to produce cubic silicon carbide, though it is a very expensive option. Thermal decomposition of polymethylsilyne also yields pure silicon carbide when it occurs in an inert atmosphere with low temperatures. This process has the added advantage of pre-forming the polymer before it is transformed into a ceramic. When silicon carbide is formed, no matter the process, the color of the crystals helps to determine the purity of a given sample. Colorless, pale yellow and green crystals are the purest. Brown, blue or black crystals indicate some degree of contamination and are less pure. Common imputiries include nitrogen, aluminum and iron, all of which affect the electrical conductivity of the final product. The crystals or grains produced by any of these methods are then bonded together by manufacturing techniques such as sintering, firing, hot pressing, hipping, extrusion, fusing, slip or pressure casting, injection molding and deposition. Silicon Carbide Silicon carbide, or carborundum, is an extremely hard ceramic composed of carbon and silicon atoms bonded in a crystal lattice. The unique characteristics of this substance make it highly desirable in several industrial and commercial settings.